Are Genesis reuniting with Peter Gabriel? Is supper ready for Genesis? 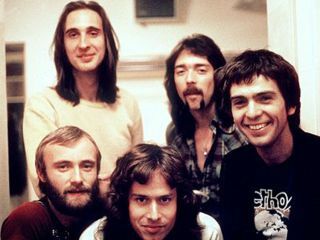 With the release of a mega-boxed set called Genesis: 1970-1975, some of the members of that classic lineup are apparently talking about a reunion. Which brings up one key question: What happened to Phil Collins's retirement? In a recent interview with Billboard, keyboardist Tony Banks and guitarist Mike Rutherford don't address this most pressing issue. But regarding a full-blown Genesis reunion, Banks says, "We've never said never about it, you know. I know Phil would be quite happy with the idea of just playing the drums; it would be quite fun for him. Mike and I are certainly happy to do it. I know (guitarist) Steve (Hackett) is keen as well. I think it'd be down to Peter (Gabriel) more than anyone else." Most people would tend to assume that progressive-leaning Peter Gabriel would be loathe to participate in a trip down musical memory lane, but it was actually he who first broached the idea of reuniting that Genesis lineup, specifically for a handful of performances of the 1974 cult favorite The Lamb Lies Down On Broadway in 2004. Gabriel later pulled out to concentrate on a solo album he's still making, but his initiative did lead to Banks, Collins and Rutherford reuniting for a tour in 2007 - and now there are hopes that the whole gang can get back together. "It would be fun to do something like that purely for the fun of working together again and seeing where it takes you," says Rutherford. Banks, meanwhile, says that rather than merely performing The Lamb Lies Down On Broadway, he'd like to see the group "do a sort of best-of from that era. You want to do things like Supper's Ready, I think, and The Musical Box, definitely." While band members speculate on a possible reunion and set list, fans can spend their holiday cash on the new boxed set, which includes upgraded editions of all five albums the group recorded between the years of 1970-75. Each has a DVD of time-appropriate performance footage and new interviews, as well as a set of rare extras. In other words, oodles of Genesis goodies. And for those who are keeping score, Phil Collins is still "retired," although it seems that is likely to change at any moment.